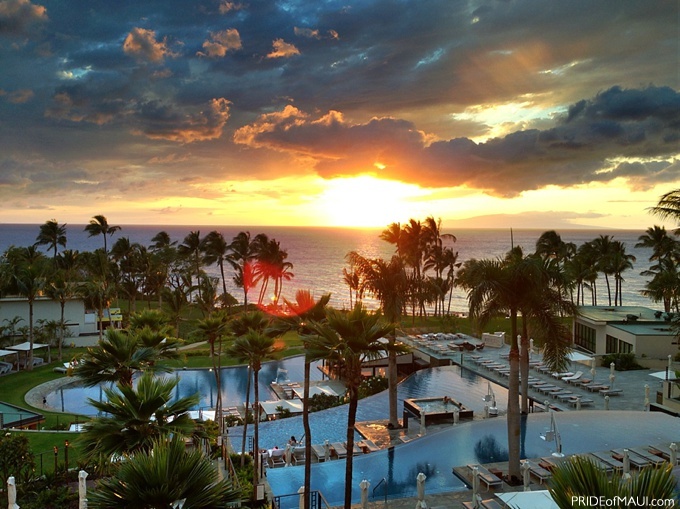 Morimoto Maui is located at Andaz in Wailea. 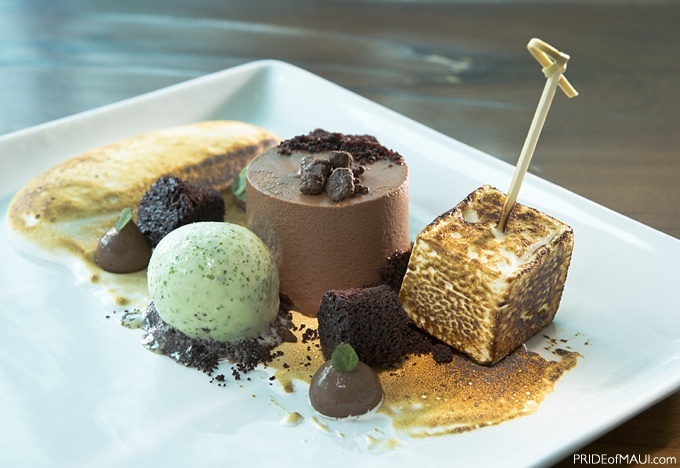 Iron Chef Masaharu Morimoto has been recognized for his fabulous integration of Western and Japanese ingredients. He opened his first sushi restaurant in Japan in 1988. 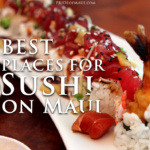 His culinary innovations have earned him countless industry awards from James Beard; Travel and Leisure; CNN; New York Magazine; Honolulu magazine and a host of others. Morimoto was inducted into the Culinary Hall of Fame in 2012. 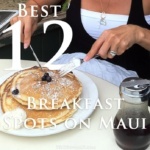 His Maui location opened in 2013. 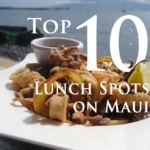 Chef Masaharu Morimoto has two restaurants in Hawaii. One in The Modern a fabulous resort hotel in Waikiki, which was opened five years ago. 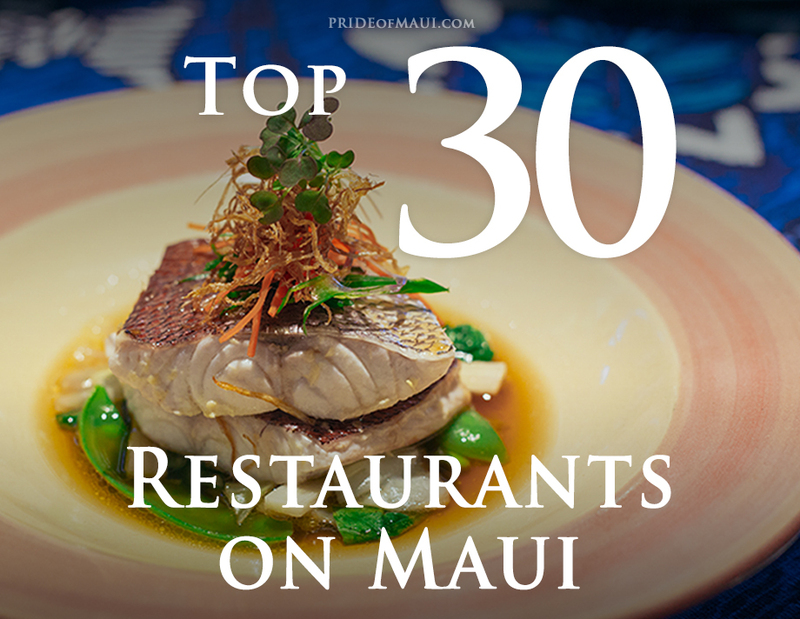 His second Hawaiian location opened in Maui two years ago. 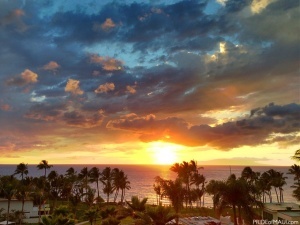 It is located at the posh Andaz Resort in Wailea. Famous for the Iron Chef series in Japan and the U.S. Morimoto has built quite a following. He has opened very diverse restaurants around the world in some very unusual locales. Morimoto has restaurants in Los Angeles, Chicago, NYC, Napa, Miami, Mumbai, New Delhi, Mexico City, Boca Raton, and Philadelphia. He has two more in the works– a small ramen house in Manhattan and in Orlando Morimoto Asia at Disney World. Quick with a smile and a fantastic laugh Chef Morimoto is very personable and he looks very young for all that he has accomplished in his life, and he’s not slowing down. He’s athletic. He works out daily. He is an avid golfer. As a young man Morimoto was about to hit the big time in baseball but a shoulder injury sidelined him. That is when he turned to cooking. 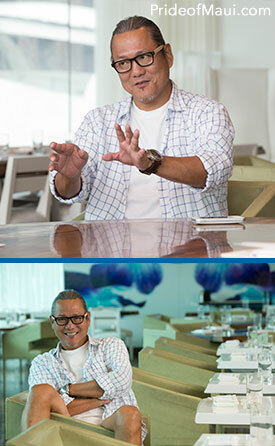 We caught up with this extremely busy man at his Morimoto Waikiki location for a brief chat. How would you describe yourself as a chef? What are your favorite ingredients? That is a question I cannot answer. It depends on the day and the restaurant. I have 15 dishes or some version of those that are at almost all of my restaurants. Then, we blend chefs’ ideas with my DNA. So each place I own uses different ingredients and different blend of cultures to fuse with mine. How closely do you work with each Executive Chef and his or her staff? I work with my chefs for six months to a year. It is a collaboration and each person has a responsibility. We want the guests to enjoy their food and their experience. So, it is definitely a collaborative effort for all of us. How much input do you have in terms of décor and design for your restaurants? What is your favorite food to make? I love all different foods-Italian, French, Spanish, Chinese, and Japanese. So, it depends on my mood just like everyone else. What do you like to eat? You are very busy so how do you do it all? What do you want your guests to feel when they leave? 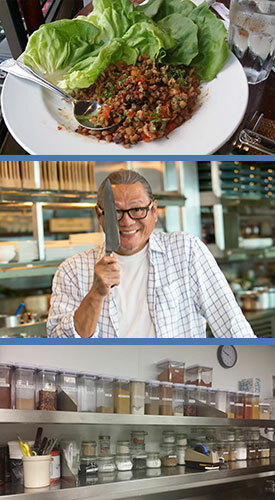 Chef Morimoto is a true Renaissance man with so much talent in so many areas! Not content with just creating incredible food and amazing restaurants, Morimoto has developed a line of specialty beers and sake. His second cookbook which focuses on “home” cooking will be out in the spring of 2016. With all of his appearances as himself on Iron Chef, Hell’s Kitchen, and other shows Morimoto can also be seen on several episodes of Hawaii 5-0. Acting just might be the next field for Morimoto to conquer and excel. 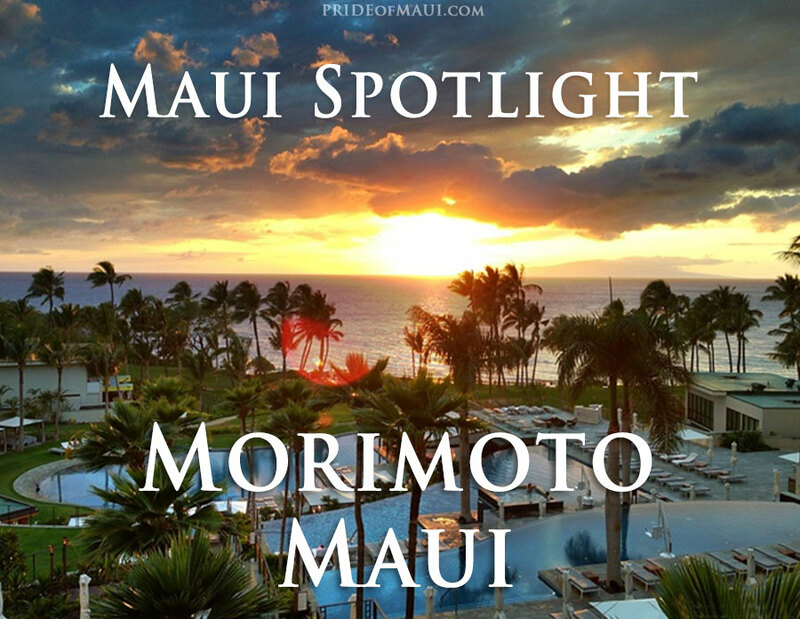 The Morimoto’s experience really began when we pulled up to the entrance of the resort. Two valets greeted us immediately, one at each door. While one was taking the keys from my dinner companion the other was asking what time our dinner reservation was scheduled for and under what name. He then relayed the information via headset to the restaurant hostess I thought. He gave us directions and we walked down a walkway that had water on each side with immense wooden posts. It felt very Asian. The lobby was stunning at a glance with a very modern Asian feel to it. We turned left and came upon a magnificent spiral staircase. There was a young female employee there who intercepted us and gave us more directions to the lower levels where the restaurant is located. We went down four or five flights of stairs until we reached the bottom. Along the way we saw infinity pools and several decks with lounge chairs and bars. The view of the ocean was spectacular. We encountered another staff person who made sure that we were headed in the right direction. When we arrived we noticed that there were outside tables on a patio along one side. We entered the restaurant and the hostess was very personable and friendly. She asked if we wanted to dine inside or out. We said inside was fine. She assured us that we would have a table by the windows. Even though the inside was virtually empty we were sat in a corner. My companion could see out towards the water but I could not. There was a large private party happening on the lawn below us and they had erected large bamboo screens for the occasion, unfortunately it blocked what little view we had. That was the only downside of the evening. Our server Chris arrived and took drink orders first. He made a recommendation on the beer choices, and did not give me even a flicker of disappointment that I was only drinking water. When he returned to our table, Chris gave us an amazing tour of the entire menu. He was so knowledgeable and took his time describing the dishes, which made us feel very special. I also liked the fact that he wasn’t pushy and he gave us time to consider all that he had talked about. We also had the Wagyu Beef Carpaccio. 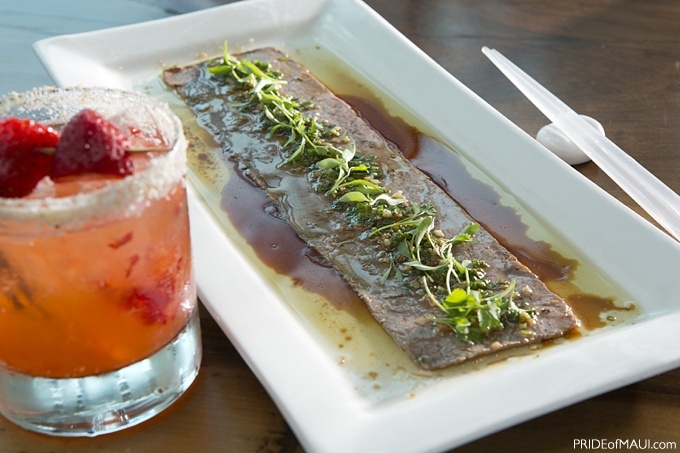 Razor thin sliced special beef flown in from Japan in a Yuzu soy sauce with ginger, sweet garlic and Japanese parsley. So delicious and tender! It truly melted like butter in my mouth. There were only two salads on the dinner menu. We opted for the Mixed Green Salad with shaved Bonito, which is smoked skipjack fish shaved into long curls, three kinds of radishes – daikon, watermelon and slices of white radish that looked like cheese (who knew that radishes could be so good?) over a variety of unbelievably fresh crisp greens. The dressing was called Kaboso vinaigrette. The dressing was very Asian and very tasty! I ordered the Braised Black Cod which was cooked in a ginger soy reduction. The presentation was beautiful. The fish was so tender and moist with a delightful glaze that tasted similar to one of my mother’s recipes. I savored every bite. As a side I ordered the XO Green Beans. They were cooked perfectly with just enough crunch left in them and an egg based reddish sauce lightly sprinkled on top. I have no idea what was in that sauce but it made the beans delicious. My dinner companion ordered the Seafood Toban Yaki. It was a super spicy Ciopinno-like stew/soup. It was so spicy he had sweat running down his face. After the first few bites I was concerned that the Toban Yaki was too spicy hence all the sweat, but my partner relished every bite. 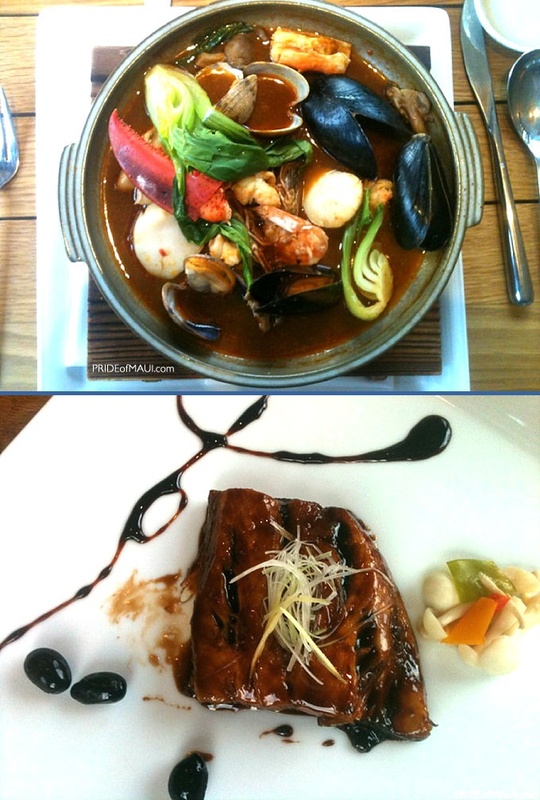 The dish blended the different flavors of each seafood with a variety of spices. I tried it and it was very Korean to me. I would recommend it to those who love hot spicy food. The dish had lobster, cray fish, King crab, clams, scallops and mussels in a red miso broth. As the sun was going down, we were having such a beautiful evening with excellent food and such impeccable service that we didn’t really care about missing the sunset. After resting our palates for a short time Chris showed us the dessert menu. He described each item with such flair that even though we were stuffed we ordered the Chocolate Carmelized Ganache with Cuban red bananas and Lilikoi puff marshmallows. This was one of the fanciest desserts I have ever had. It was light and so full of flavor. And it had such a variety of flavors! Then, we decided on a to go order of the Doughnuts which are really Malasadas (those square Beignet shaped Portuguese doughnuts), and six of them were placed in a gift box with three very sweet sauces, Waialua Chocolate, Sake Caramel and Apple Banana Cheesecake. My favorite was the Apple Banana one even though I am a devout chocoholic. When we left the restaurant everyone made a point of telling us good bye. Mina the young woman who assisted Chris was so vivacious and charming. We enjoyed her energetic personality very much. Chris was exceptional. He was so knowledgeable about every menu item and such a professional. We were very impressed with Chris. 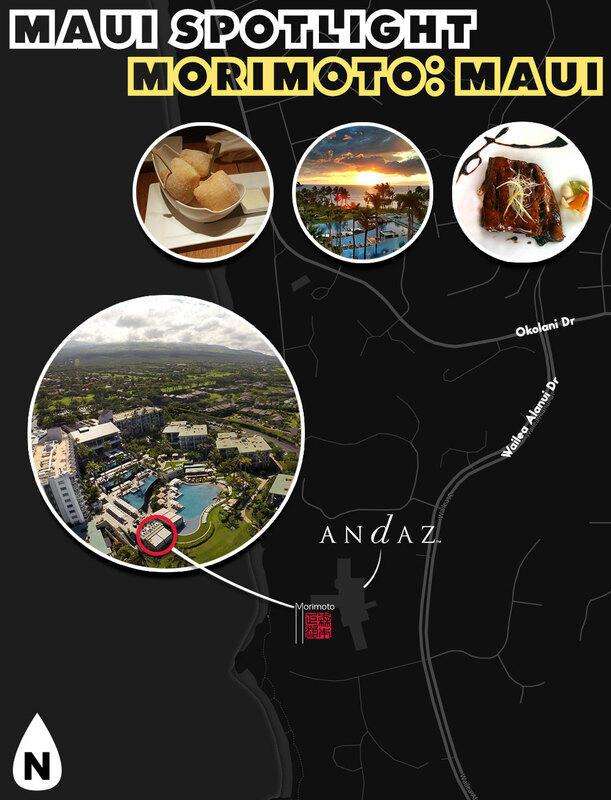 I know that Andaz is a high end resort but every person on the staff that we encountered while walking to and from the restaurants was so warm friendly and helpful. From the moment we arrived until we got back into our car we had a lovely evening! Morimoto’s was fabulous from the appetizers through the desserts. 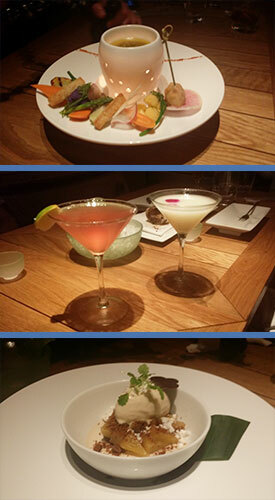 Every dish was exotic, prepared with considerable thought and remarkably layered with different flavors. 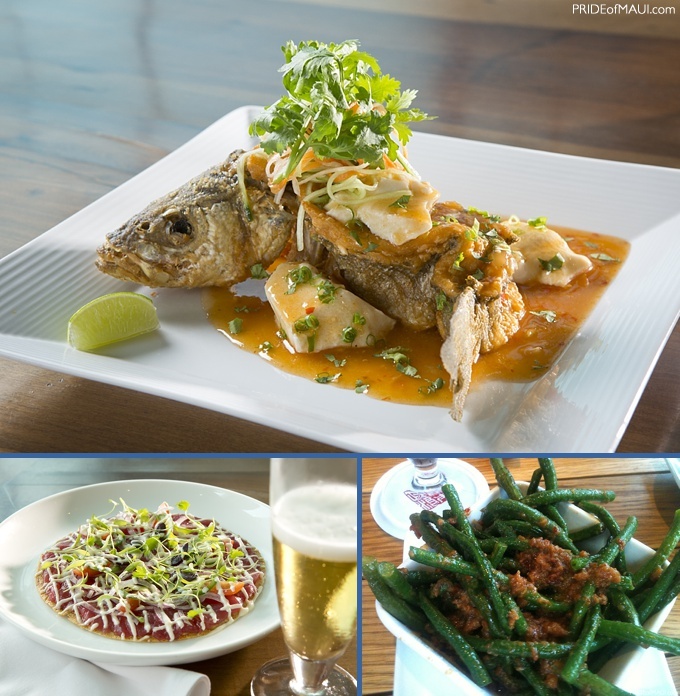 Morimoto is all about texture and taste. Every dish that I tried had layers of deliciousness. This was truly an amazing and unusual dining experience that I would highly recommend. There is one word of caution though. The restaurant is down at beach level at the bottom of five flights of stairs. No elevator. There is a ramp that ADA folks can use that is pretty well hidden but it seems as if that would take a tremendous amount of effort especially getting back up to the lobby level. Shirley Enebrad is the author of two books with two in the works. She writes a blog on her website at ShirleyEnebrad.com that focuses on grief issues. A multiple award-winning TV Producer/Writer, Shirley enjoys producing documentaries, writing, the Hawaiian culture and exploring the islands. Copyright © 2019 Marine Charters LLC. All Rights Reserved.